The LG G2 can handle all common message types: SMS, MMS and email. Email capability is excellent with support for Exchange available out of box, and social media buffs will be pleased with the level of SNS integration as well. Moving on to email, the first thing you'll notice is that Google has done away with the bottom bar that hosted buttons for new mail, search, labels, refresh and menu. Three of those have now been moved to the action bar on top and refresh has been integrated into the UI, in the shape of pull to refresh. The new Gmail app now displays contact images in mails. If an email has multiple recipients, they're shown in a grid similar to the Hangouts app. If there is no contact image, it just shows the first letter of the sender on a color background. You can disable sender images in the email app if you wish. 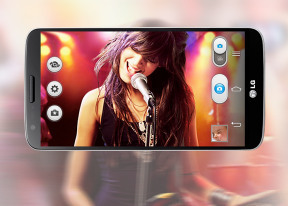 The LG G2 offers a standard QWERTY keyboard, which features both portrait and landscape typing. The keyboard fills up the screen nicely and offers great ergonomics with ample spacing between keys, still leaving enough room above the keyboard for you to see what you're actually typing. You can opt for one-hand mode, where the keyboard becomes smaller and sticks to the left or right side of the screen. It's invoked by flicking the portrait keyboard sideways and that way you can use it only with your thumb. You can also split the landscape keyboard in two by doing a simple pinch gesture on it. The LG G2 uses the same gallery app as the Optimus G and G Pro - in effect, a near stock Adroid gallery with a few custom touches here and there. It automatically locates images and videos no matter where they are stored on the phone. By default, images are sorted by albums, but you can sort by location or time as well. The different sets are tiled neatly across the screen. You can expand or shrink individual albums using a pinch to zoom gesture, making the elements of the grid of photos either really huge or very tiny. Once selected, you can view an image close up by pinch zooming or double tapping on the desired area. There is a sliding gallery along the bottom which allows you to quickly browse other images in the album. On the top there are three shortcuts for quickly sharing, editing or deleting the selected photo. The Share feature offers quick sharing via Email, Google+, Picasa, Memo, Hangouts, MMS, SmartShare, VuTalk, Picasa or Bluetooth. The Gallery app displays images in full resolution. Zooming and panning involves no lag whatsoever on the G2.